Cool technique, love that cup, Happy coffee day! Lovely golden coffee cup - I would far rather drink coffee than tea, and especially out of such a gorgeous vessel. Fabulous card! Lovely fall coffee card, Julia! Happy coffee day! very nice! love the background paper! Sooo pretty!! Happy coffee day!! Such a pretty card Julia! 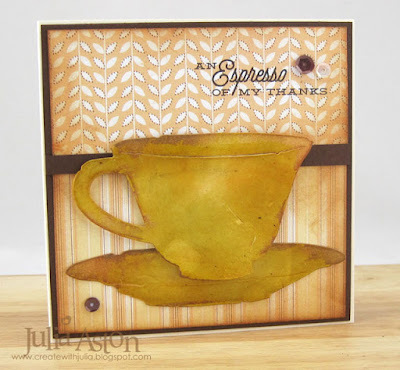 Wow, beautiful card, love the pretty gold coffee cup with those background papers! Fabulous! Your gold cup and saucer look amazing! Very pretty, such a nice soft design! HOW CUTE!!! LOVE THE SENTIMENT. Wow, how beautiful! I love the papers you used and that mug is incredible! Such a cool card! Love the gilded treatment on the mug. Thank you for sharing! Beautiful! 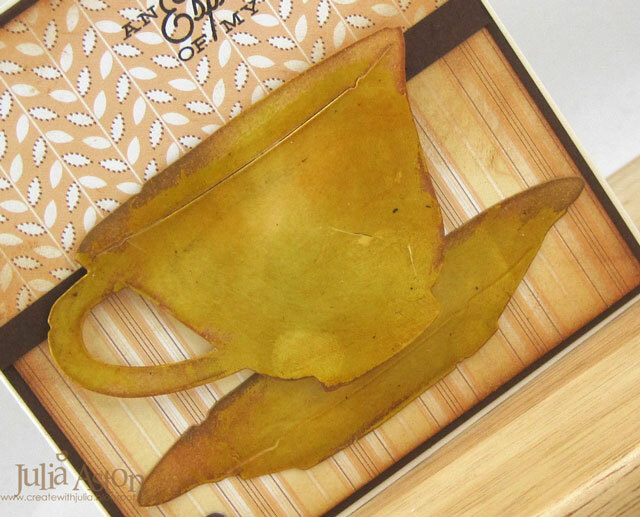 Love these papers and that gorgeous cup! That cup looks almost real vintage piece :) simply stunning !! Very pretty, cup and paper!! I'll have to come back and check out that faux gilding technique... and I LOVE the funkie junkie!.. love the way she packages stuff.. and I feel like the packaging is extra stuff to use on my projects too... love your card! Love the technique you used on your card. I'll be back to view the tutorial; but have to move on with blog hop. Very pretty card.